Just as quickly as Halloween came this year, I realized I was once again behind on launching my website. Excuses this year will be work, freelance work, Christi and Stanley. Christi will probably just tell you I'm lazy, but I'm pretty sure that Stan is on my side. The yearly tradition of carving pumpkins lives on. Christi masterfully demonstrated how she has no problem with the "difficult" templates while I decided to fire up Photoshop this year and make my own. 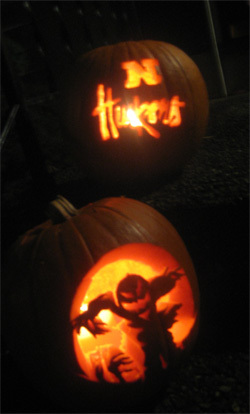 I figured after Nebraska got back on track earlier that day, how could I pass up the opportunity to create a Husker pumpkin? As for when the new site will go live, I think the soft launch date will be the week before Thanksgiving/Christi's birthday since we're going out of town that weekend. I'm hoping to wrap everything up in the next few weeks and get it out the door. For those die hard brianhelge.com fans out there (really, are there any? ), you've stuck with a late launch before, so what's one more year?